It’s all too easy to daydream about jaunting across Europe and chronicling your adventures on the road. So, stop imagining, and get writing, because WorldNomads.com wants to send 3 aspiring travel writers on the ultimate European road trip this summer. If selected, you will be flown from your country of residence to Berlin, Germany, where you will spend 2 days at the very first World Nomads Travel Writing workshop under the mentorship of veteran Lonely Planet author and industry mentor, Alex Leviton. After the workshop, you will head off solo on a 10-day European road trip, travelling around thanks to GoEuro and staying in top accommodation with Hostelworld each night. During your road trip, you will be tasked with capturing your daily adventures on your World Nomads blog and sharing your local experiences on Instagram. 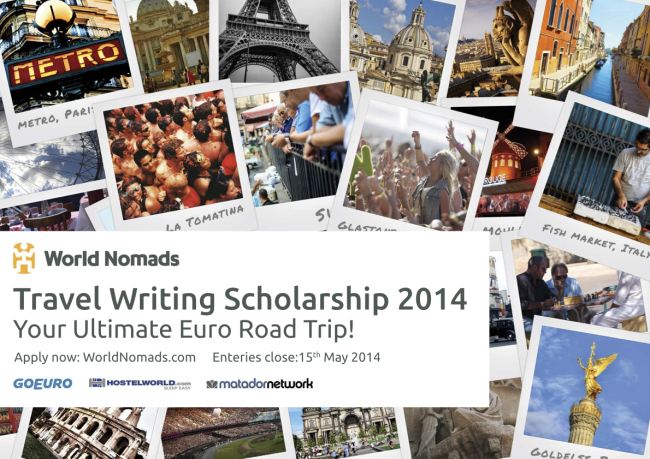 The winners and shortlisted applicants will also receive enrollment into a MatadorU travel writing course. Veteran river outfitter and nature-based adventure travel company, O.A.R.S., has partnered up with outdoor industry leaders The Clymb, Northwest River Supply (NRS), and Teva for an online contest that gives contestants a chance to “live the dream” as a guide apprentice on an O.A.R.S. Grand Canyon rafting trip. The winner will be a bonafide member of the O.A.R.S. crew, helping load boats, spending time on the oars, helping prepare meals and mingling with clients. To enter participants must sign up via a custom app on the O.A.R.S. Facebook Page. “The winner just has to show up ready to pitch in and help and be awed by what the Canyon has to offer,” said Steve Markle, O.A.R.S. spokesperson. The 14- to 18-day trip will take the winner 280 miles through one of the Seven Wonders of the World, running legendary rapids and exploring hidden side canyons on one of the most popular adventure travel experiences on the planet. The winner will also receive a guide gear package that includes a personal flotation device, apparel and footwear provided by NRS and Teva. The contest runs July 15 through August 19. To enter participants must sign up via a custom app on the O.A.R.S. Facebook Page by submitting their name, email address, an adventurous photo of themselves and a short essay on why they’re the best candidate for the job. Between Aug. 25 and Sept. 8, the O.A.R.S. Facebook community will cast their vote for the winner from 10 finalists selected by O.A.R.S. staff. In addition to the grand prize, one contestant per day will be selected at random to win a copy of the book, The Emerald Mile: The Epic Story of the Fastest Ride in History Though the Heart of the Grand Canyon, by Kevin Fedarko, and a weekly winner will be selected to receive a free pair of Teva Original sandals. Is an African safari on your bucket list? Do you dream of photographing the extraordinary wildlife, seeing the vast plains of the Serengeti, and staying in luxurious camps, with all the comforts, in of some of the planet’s most amazing wilderness? Get ready, because Mountain Travel Sobek (MTS), pioneers in adventure travel, just launched an Ultimate Tanzania Sweepstakes in celebration of their 40th anniversary. -Roundtrip airfare from Exito Travel. -Gear pack with safari clothes and goodies from Magellan’s. Sweepstakes ends July 18th, 2013. No purchase necessary to win. I have a soft spot in my heart for Peru and its people. My husband and I recently spent nearly five months in the vibrant city of Cuzco (often spelled Cusco) and fell in love with the country and the friends we made during our extended stay there. So, it is with pleasure that I share this Pass on the Gift® in Peru Sweepstakes sponsored by catalog merchandiser, Garnet Hill, and Heifer International, a nonprofit organization seeking to end hunger by partnering with and empowering small-holder farmers around the world. One grand prize winner will be awarded an all-inclusive trip for two to the ancient Incan Empire capital of Cuzco where they will experience the vibrant local culture and have an opportunity to participate in Heifer’s local alpaca project in the Andean region near Cuzco, an initiative designed to end poverty in the region and foster sustainable development. Best Job in the World is back: This time with not one, but six dream jobs up for grabs. In 2009, Tourism Queensland put the word out that it was hiring a ‘caretaker’ for its Great Barrier Reef with job benefits including a large salary, free lodging in a multi-million dollar villa, and transportation there and around the islands. The campaign went viral. This time, Australia is teaming up with industry, State and Territory tourism partners for a new ‘Best Job in the World’ global competition offering not one, but six dream jobs, each with an attractive six month salary package worth A$100,000 including living costs. Rough Guides and WorldNomads.com have teamed up to offer an aspiring travel writer the chance to go on assignment with a Rough Guides author to Beijing, China. 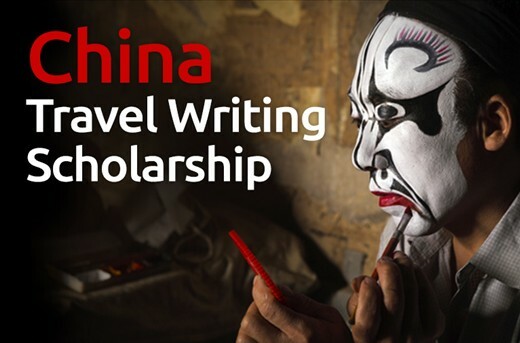 If you think you have what it takes, check out their 2013 Travel Writing Scholarship, a 12-day trip to Beijing to unearth the stories that make this city the spiritual and political heart of China. The contest offers real on-assignment experience and the fast-track to becoming a published travel writer. First, you will join Rough Guides writer and mentor, Martin Zatko, on assignment in Beijing to both learn about guide book writing and complete an assignment of your own (including a review of the Forbidden City). Your resulting work will be considered for publication in the next Rough Guide to China. Next, you’ll join international travel journalist and Beijing local, Kit Gillet, for a three-day adventure into his backyard to explore the hutong alleyways, the burgeoning Chinese art scene and even spend a night camping on the Great Wall! And, for the last leg of the scholarship, discover the rich food culture of Beijing with three culinary experiences (think tea tasting and dumpling making classes) from Hias Gourmet. To enter, submit a personal travel essay on one of four provided themes and tell why you should be awarded the scholarship. Head to the World Nomads Scholarship page for more information and to apply. Entries close April 19, 2013.